A couple of months ago, the Mr moved in to his own place. I say his, but really I’m there more than he is, so it’s ‘ours’. Anyhow, his mum sends us a lot of vegetables from Nakuru; she is just the sweetest! Usually, lots of spinach, maize, peas, beans, oh and plenty of avocado too! So you can imagine our fridge looks eternally full with greens! 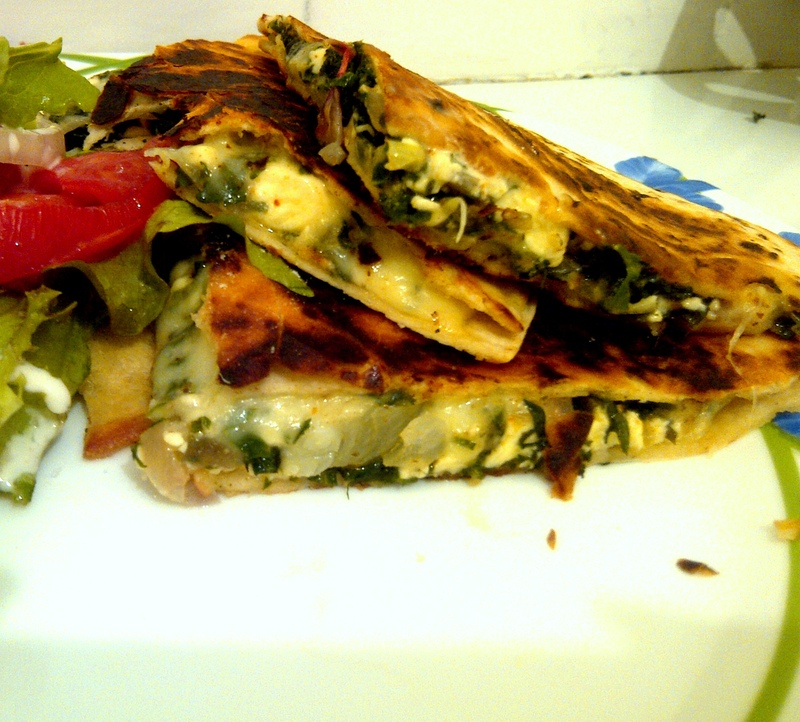 The idea of spinach and feta quesadillas came when I stumbled upon a similar recipe online (I do spend a lot of time online, looking at food). Anyway, I remembered my fridge full of spinach and the block of feta I had leftover from last week; light bulbs lit up and bells were ringing… I had my meatless Monday plan! There wasn’t much to buy, well other than gas to cook with, which we had to go out in the rain to find… And let’s not forget that when I need tortilla wraps, THERE ARE NONE in the supermarkets! We had to hop from one Nakumatt to another in the rain… did I mention I just got my hair did??? *Sigh* Poor Babu endures way too much, just for a meatless dinner… If that isn’t love, I don’t know what is! Melt butter in a pan, place one tortilla in the pan. Sprinkle mozzarella followed by the spinach filling and a little more mozzarella. 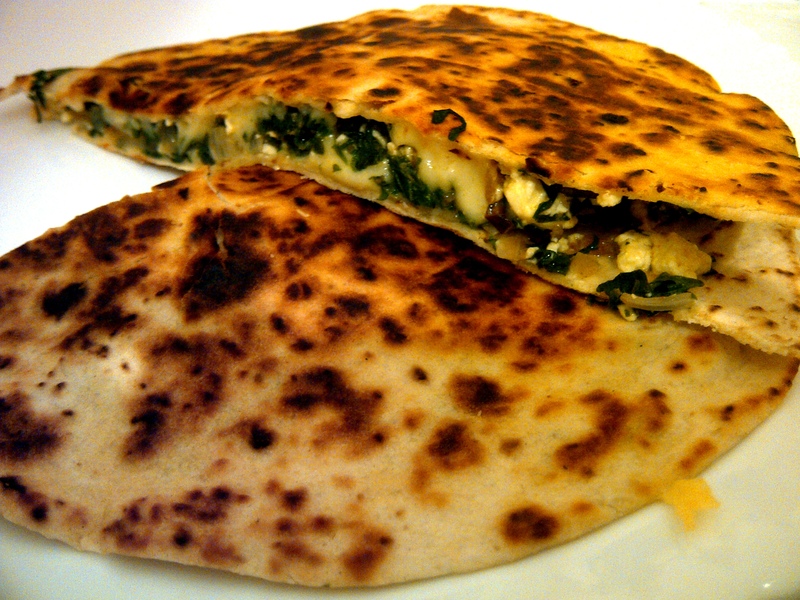 Top with a tortilla and cook until golden brown and cheese is melting. I should mention that you should flip the tortillas over after about 2-3 minutes to avoid burning like I did. I loved these, I will be making them again soon, maybe throw in Julia Child style sautéed mushrooms, or sun-dried tomatoes, or slices of grilled aubergine… Or just throw all of them in together and see what you get! I served these bad boys with a salad, which Babu lovingly made! followed by watermelon and mint sheesha… we are just that kind of couple!